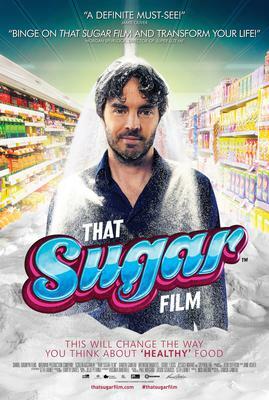 THAT SUGAR FILM is a great film out of Australia done by Damon Gameau. There are so many of these inspiring and educational films coming out now that are helping the masses to shift towards more natural living and healthier lives .. towards Making Healthy Choices! I recently watched That Sugar Film ... and then watched it again. It is so well done and easily and in a very entertaining fashion shows us how sugar hugely damages our health. Do you remember the movie Super Size Me? Where a healthy man chose to eat McDonalds every day for 30 days to see what would happen to his health? Well, That Sugar Film is like that but with sugar. Damon Gameau is a healthier than average man who hasn't eaten refined sugar for quite a while. For 60 days, he will eat the same amount of sugar (in the form of sucrose and fructose) that the average Australian eats each day. And all of this sugar will be in the form of 'hidden' sugars in so called 'healthy' foods. The average Australian eats about 40 teaspoons of sugar each day and most of that is sugar that is hidden inside of other foods (did you know that there is sugar in ketchup, granola bars and yogurt?). This film is done by an Australian guy but the same goes for most Americans who eat just as much, if not more, sugar per day. His first meal on this 60 day journey consists of a meusli type cereal with yogurt and some apple juice. Many people consider this to be a healthy way to eat but in actuality this meal contained about 20 teaspoons of sugar!! Damon had eaten half of his daily allowance of 40 teaspoons of sugar in just that one morning meal! That alone goes to show how many people out there consume far more than 40 teaspoons of sugar a day ... and do so while believing that they are eating healthy! They pose the question, "Would these diseases exist if sugar wasn't in the diet???" In just 60 days (and actually far sooner than 60 days) you will be amazed at what happens to Damon. It is a real eye opener to anyone out there that consumes sugar. And it is a real eye opener to many to see what eating sugar really means. It is not just candy and ice cream like you might think. Did you know that if you removed from the store shelves every item that had sugar in it that you would only be left with about 20% of items?!? The thing about this is that too many people have been eating this way for far too long - so long that people have come to think of abnormal health as normal and even healthy. People who have lived their whole lives like this have no idea that they are actually not as clear minded, energetic and vibrant as they are actually designed to be! I highly encourage you to watch this film. Watch it with friends and family. Show it to children in schools or to children anywhere. This is a great film for anyone doing programs with children to show to them. Show it to your employees, to your boss, to your colleagues, etc. I love this film because it is easy to watch, fun to watch, very entertaining ... and has such an important message. Great blog on healthcare. I have read your blog and you explain everything so properly. Thanks for sharing such information..
Have you seen this film yet? Leave a comment and tell us what you thought.